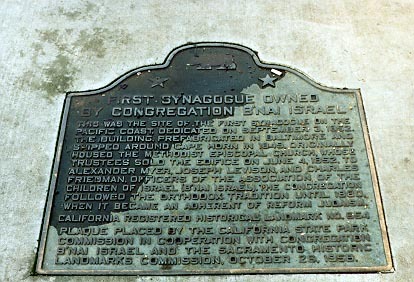 This was the site of the first synagogue on the Pacific Coast. Dedicated on September 3, 1852, the building, prefabricated in Baltimore and shipped around Cape Horn in 1849, originally housed the Methodist Episcopal Church, whose trustees sold the edifice on june 4, 1852, to Alexander Myer, Joseph Levison, and Charles Freidman, officers of the Association of the Children of Israel (B'nai Israel). The congregation followed the Orthodox tradition until 1880, when it became an adherent of Reform Judaism. In sidewalk, 7th St between Capitol and L, Sacramento. Return to other landmarks in Sacramento county.